The Montana House and the Glacier National Park Conservancy are pleased to co-host another in the series of “Look Listen and Learn” presentations. 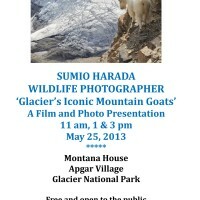 Professional photographer Sumio Harada will show a documentary about mountain goats that was filmed in Glacier National Park by a Japanese broadcasting station. Sumio served as a guide to the TV crew for 60 days during the months of June, July, and November of 2012. The documentary has only been shown in Japan and Sumio wants to share the program with local people around Glacier National Park. Although the narration is in Japanese, he will translate in English when it is necessary. 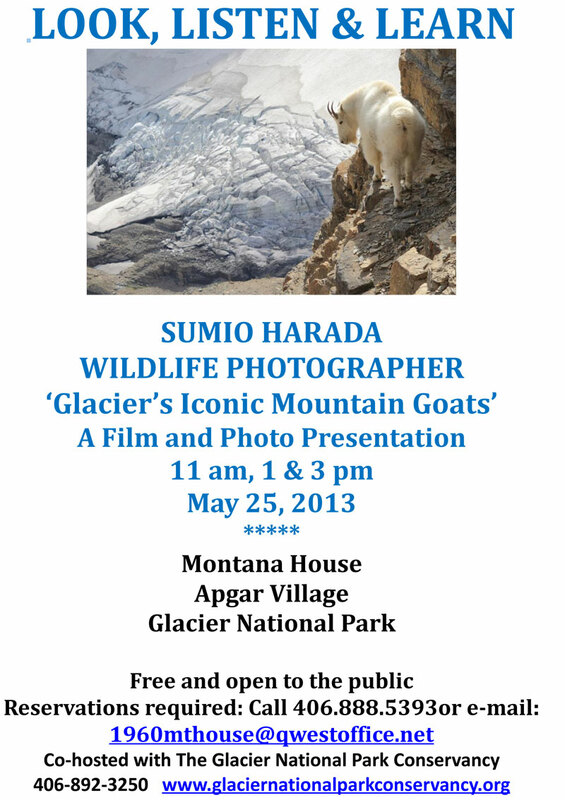 Additionally, Sumio will show several of his latest mountain goat photographs. There will be two presentations, one at 1pm and the other at 3 pm, with time for questions and a reception to follow. The event is open to the public without charge, but seating is limited, so reservations are required. Please call 406-888-5393 or email: 1960mthouse@qwestoffice.net for additional information and to reserve your seats. Sumio is a renowned photographer known for his stunning images of wildlife and landscapes in the Rocky Mountains. His work has been featured in major magazines including National Geographic, National Wildlife, Ranger Rick, Canadian Wildlife and Montana Magazine. His photo book Mountain Goats of Glacier National Park, DVD collection The Breaths of Glacier, and many of his photographs are available for purchase at the Montana House. Hans and Toni Jungster established the Montana House Regional Craft Shop in 1960 in Apgar Village, just inside Glacier National Park. Their daughter, Monica and staff continue to carry on their mission: to celebrate and promote the creativity of Montana and Native American artists and craftsmen for our mutual benefit. The Montana House has been a long time avid supporter of Glacier National Park and celebrated its 50th anniversary on June 26, 2010. The shop is open all year.